Turns out it’s not bad being top dog, or in this case, top baboon. 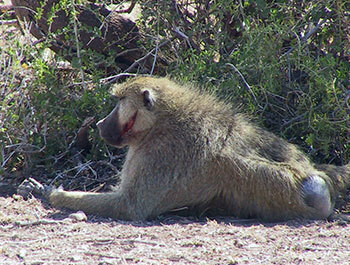 A new study by University of Notre Dame biologist Beth Archie and colleagues from Princeton and Duke Universities finds that high-ranking male baboons recover more quickly from injuries and are less likely to become ill than other males. Archie, Jeanne Altmann of Princeton and Susan Alberts of Duke examined health records from the Amboseli Baboon Research Project in Kenya. They found that high rank is associated with faster wound healing. The finding is somewhat surprising, given that top-ranked males also experience high stress, which should suppress immune responses. They also found that social status is a better predictor of wound healing than age. 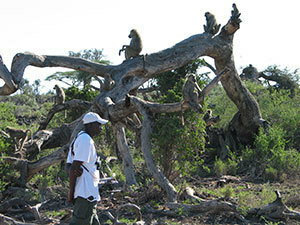 The researchers examined 27 years of data on naturally occurring illness and injuries in wild male baboons, which is a notably large data set. Although research of health and disease in animals in laboratory settings has been quite extensive, this study is one of most comprehensive ever conducted on animals in a natural setting. The research team investigated how differences in age, physical condition, stress, reproductive effort and testosterone levels contribute to status-related differences in immune functions. Previous research found that high testosterone levels and intense reproductive efforts can suppress immune function and are highest among high-ranking males. However, Archie and her colleagues found that high-ranking males were less likely to become ill and recovered faster from injuries and illnesses than low-ranking males. The authors suggest that chronic stress, old age and poor physical condition associated with low rank may suppress immune function in low-ranking males.